Lots of players won big money by betting on the Sand Snake Tyene to die, with Emi Tolibas poised to take over the Seven Kingdoms with $412. Tyene wasn’t the only one to leave last week, with Josh Modell the first to hit zero dollars and the first to leave our dead pool. Eckstein the oddsmaker says: She basically said she’s dying, so might as well go ahead and die. The A.V. Club says: She implied she’d go back to Volantis and then come back to die, so she may yet have more royal-burning, queen-whispering, Prince That Was Promised-ing to do. Eckstein the oddsmaker says: He’s not doing much these days other than sneering. I absolutely hate his little sneer. The A.V. Club says: If Sansa killed him, that would be wonderful. Eckstein the oddsmaker says: I think being cooped up at Dragonstone the way he is, he’s going to get pissed and mouth off to the wrong person. Maybe a dragon will pick him up. The A.V. Club says: Not Davos! Not our Onion Knight! Eckstein the oddsmaker says: I really like her, but she’s in trouble. The A.V. Club says: Her outlook is not good right now. Eckstein the oddsmaker says: Eventually they’ll all die, it’s just a matter of when. The A.V. 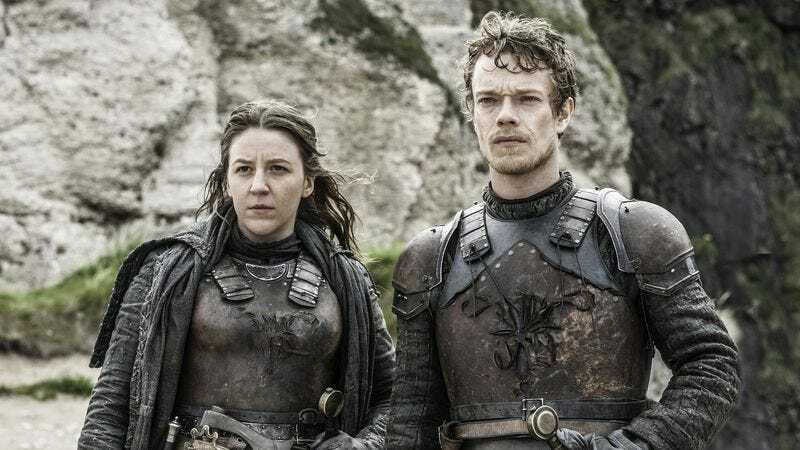 Club says: There are a total of eight Sand Snakes—two were killed by Euron Greyjoy, one by Cersei’s poisonous kiss (or so we presume), leaving five more—three of which are Ellaria’s children. Maybe Dorne still has a part to play in the game of thrones? Eckstein the oddsmaker says: I really like him. I would hate to see him go. The A.V. Club says: Someone we care about will probably die soon, and Greyworm would be a good emotional death. Eckstein the oddsmaker says: They’re going into battle. The A.V. Club says: Now that Sam has cured Jorah of his greyscale and figured out the dragonglass thing for Jon, what role does he have to play? His father and/or brother dying would make him, and his story, relevant to the show. 3-1 They pledge to unite. 5-1 Jon leaves without any agreement. 10-1 They make sweet love. 50-1 They become the new Regis and Kathie Lee. Emi Tolibas ($412 Westerosi bucks in the bank): $20 on the under. John Teti ($350): $200 on the field. Marah Eakin ($130): $10 on Melisandre, $20 on Yara, $10 on Tarlys, $20 on the field. Karl Blomberg ($110): $30 on the field. $20 on anyone else killing Cersei. Danette Chavez ($90): $10 on the field, $10 on Arya fulfilling the prophecy. Caity PenzeyMoog ($76): $20 on the field, $10 on Yara, $5 on the Tarlys, $5 on Littlefinger. Erik Adams ($34): $10 on Arya killing Cersei eventually, $24 on the field. Grace Thomas ($25): $10 on dad/brother Tarly, $5 on the field.